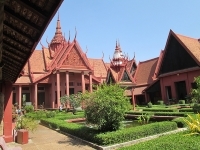 The National Museum is a striking and famous example of the Khmer architectural tradition and houses the country's most important collection of ancient Cambodian cultural material and Khmer art. It is made up of four galleries containing relics, sculpture, art, and tools covering history from the prehistoric, the pre-Angkorian, the Angkorian, and the post-Angkorian periods of Cambodian culture. The pieces are arranged in chronological order and the already impressive collection continues to grow as new treasures previously hidden from the Khmer Rouge are discovered. The museum houses original relics and sculptures from the temples of Angkor, making a visit a natural accompaniment to exploring the temples. The museum was built in 1917 but has expanded over the years to include a beautiful central garden with fountains and greenery, a serene place to rest and relax after touring the exhibitions. Guided tours in English and French cost a bit extra but they are worthwhile as the printed information in the museum is minimal. Photography is not allowed inside the building. The gift shop sells books, souvenirs, and replica sculptures. Admission: $10 adults, $5 children.